U.S. Department of Agriculture (USDA) Natural Resources Conservation Service (NRCS) State Conservationist Salvador Salinas with Federal and state partners, including representatives from U.S. 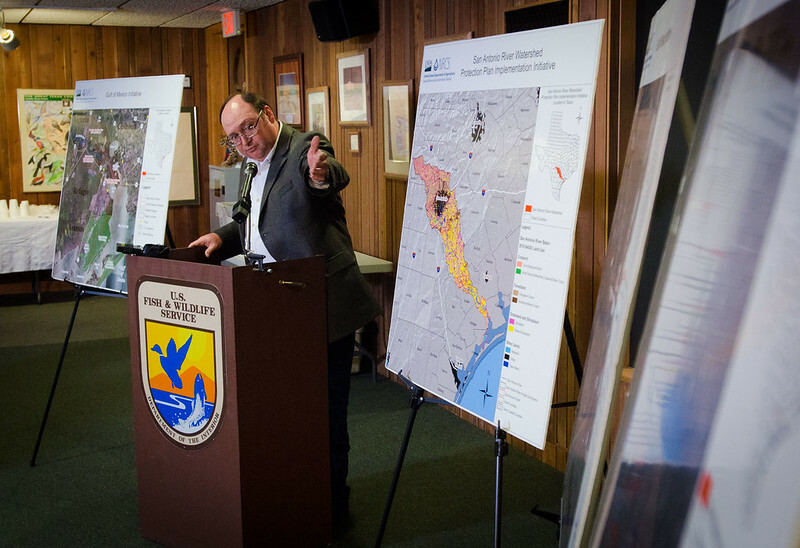 Fish and Wildlife Service and local soil and water conservation districts (SWCDs) held a press conference at the Aransas National Wildlife Refuge, in Austwell, TX, on Friday, Dec. 16, 2011. Salinas covered the recent announcement of the USDA-NRCS Gulf of Mexico Initiative (GoMI) efforts to improve water quality, habitat, and the health of the Gulf ecosystem. “Launching this initiative is a top priority for NRCS in Texas because the Gulf of Mexico is one of our state’s premier natural resources. It provides vital habitat for wildlife, and creates jobs in industries that depend upon them. The health of this resource is essential to Texas as well as to the nation,” said Salinas. The Texas initiative focuses on three watersheds in Refugio, Calhoun, Victoria and Aransas counties and ultimately the Gulf of Mexico. “What is really compelling about GoMI and other similar conservation efforts is that they prove that Texas farmers and ranchers not only feed and clothe us and power our vehicles, but they can also help protect and restore our rivers and provide more habitat for wildlife,” stated Salinas. “That’s why it is important that this conservation project is not about taking productive farm land out of production. This is a working lands initiative, so that not only are we helping to restore the health of the Gulf, but we’re also helping to sustain and enhance the productivity of the Gulf’s farms and ranches.” USDA photo by Lance Cheung. Image published by USDAgov on 2011-12-22 00:25:23 and used under Creative Commons license.